The chilly water fishing pattern is starting here this November on Mosquito Lagoon, the water temperatures are dropping, water clarity is improving and getting clear again. 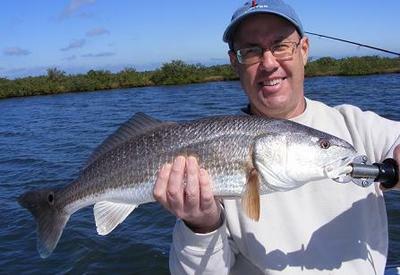 Had a great charter this morning with Harold and Dan from Jupiter, Florida, here is Harold with a nice 25" Redfish. Come fish with me on beautiful Mosquito Lagoon Florida. I offer either flats fishing mainly targeting Reds, which can be a little more challenging type of fishing, as we hunt for the fish on the grass flats of the lagoon waters. With winter approaching next month the patterns are changing with cleaner water and more sight fishing opportunities. The Redfish are beginning to school as the waters chill, which is a fishing pattern that flats fishermen look forward to each winter. This is also a good time of year for my mixed bag trips which is a fun easy type of fishing, in the Indian River Backcountry at the north end of the Mosquito Lagoon, this type of fishing is for Seatrout, Redfish, Black Drum, Jack Crevalle, Ladyfish, & other saltwater fish. On the average Backcountry trip we catch over 10 different species of fish. You never know what will bite with this type of fishing, mainly drift fishing while free lining live shrimp on light tackle make for lots of rod bending and drag pulling. Fun for experienced anglers and an easy way for less experienced anglers to be successful at catching lots of fish. As we are out catching fun saltwater fish we will be seeing lots of wildlife up close and personal near the boat with Dolphins and many different bird species on just about every trip. We will pick the best choice of which type trip will be the best for "catching" on your day out with me depending on your preferences for a fun day. Located close to DAYTONA BEACH, NEW SMYRNA BEACH and ORLANDO, FLORIDA. Feel free to contact me at any time with questions you may have about my fishing charters. 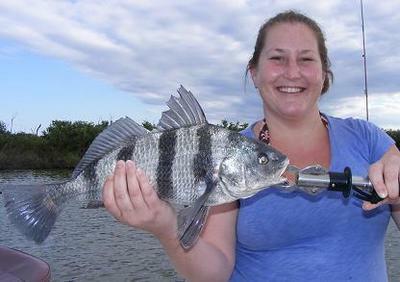 Mosquito Lagoon Fishing Guide. Also Eco-Tours, Sightseeing, Bird Watching, Photography Trips.